A 3. 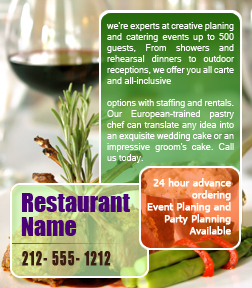 5 x 4 inches square corner catering and restaurant magnets are favored by restaurateurs and caterers who wish to promote their business easily with fewer efforts and within a restricted budget. Advertisers can make savings on bulk purchases and also win free shipping, art set up and designing. Assured visibility and improved business turnouts make this a favored choice of restaurateurs.